* The A(H3N2) component was recommended on 21 March 2019.. The recommendation includes a change in the A(H1N1)pdm09 component of the egg-based vaccine. The change in recommendation was based on differences in the response of recent circulating viruses to human post-vaccination sera compared to the cell- and egg-grown viruses of the previous A(H1N1)pdm09 vaccine strain. The decision to delay the selection of an A(H3N2) component of the vaccine arises from the continual rapid evolution of circulating A(H3N2) viruses and challenges in generating candidate vaccine viruses. In particular, the proportion of viruses in one antigenically distinct group has increased in recent months. Postponing the recommendation will enable more time to monitor circulating viruses and characterise potential vaccine viruses. The recommendation includes a change in the A(H3N2) component of the egg-based vaccine. This is because a larger proportion of recently circulating viruses were well inhibited by ferret antisera raised against egg-propagated A/Switzerland/8060/2017 compared to the previous vaccine strain (A/Singapore/INFIMH-16-0019/2016). The new vaccine strain belongs to an antigenically distinguishable genetic subclade compared to the previous vaccine strain. The B/Victoria component of the vaccine has also changed because globally, an increasing proportion of circulating viruses are antigenically similar to B/Colorado/6/2017 and different from the previous vaccine virus (B/Brisbane/60/2008). This recommendation includes a change in the B/Victoria-lineage component of the vaccine. The change was due to an increasing proportion of viruses in North America, Europe and elsewhere that are similar to the newly recommended vaccine virus B/Colorado/6/2017, which is somewhat different to the previous vaccine virus (B/Brisbane/60/2008). It is recommended that quadrivalent vaccines containing two influenza B viruses contain the above three viruses and a B/Brisbane/60/2008-like virus. The Centre is especially pleased the most recently added virus in the vaccine recommendation, A/Singapore/INFIMH-16-0019, was originally submitted to us by the National Public Health Laboratory (Singapore). This is in addition to B/Phuket/3073/2013, which was first included in the WHO vaccine recommendation in September 2014 and previously sent to the Centre by the Thai National Influenza Centre (Bangkok, Thailand) in 2013. We are pleased to introduce Dr Kanta Subbarao, who has commenced her position as Director of the WHO Collaborating Centre for Reference and Research on Influenza in Melbourne. Kanta was previously at the National Institutes of Health in Bethesda MD, USA where she was a Senior Investigator and Chief of the Emerging Respiratory Viruses Section, Laboratory of Infectious Diseases, National Institute of Allergy and Infectious Diseases (NIAID). Her research interests focus on the pathogenesis of influenza and influenza vaccinology, especially pandemic influenza, as well as studies of other emerging respiratory viruses. Having worked extensively in both influenza public health and research for many years, Kanta is looking forward to combining her interests as part of her new role at the Centre. This is the first change in the A(H1N1)pdm09 component of the recommended vaccine composition since 2010. The change in recommendation was based on differences in the response of recent circulating viruses to human post-vaccination sera compared to the previous A(H1N1)pdm09 vaccine strain and a number of changes in the haemagglutinin protein that have occurred recently. This is the same as the recommended vaccine composition for the southern hemisphere 2016, reflecting that there has been no significant antigenic drift in circulating viruses since the last Consultation in September 2015. This recommendation has changed from the recommended vaccine composition for the northern hemisphere 2015-2016, reflecting antigenic changes in A(H3N2) viruses and increasing numbers of B/Victoria lineage viruses. This recommendation in unchanged from the recommended vaccine composition for the southern hemisphere 2015. The Centre's Director, Professor Anne Kelso has been appointed as the new Chief Executive Officer of the National Health and Medical Research Council (NHMRC). The NHMRC is the primary Australian Government organisation responsible for providing health and medical research funding and developing health advice and guidelines. Professor Kelso will take up her new position with the NHMRC in late April 2015 and the process for appointing a new Centre Director will commence shortly. Staff members from the Centre were co-authors with collaborators in the United Kingdom, the Netherlands and Vietnam on a paper recently published in the journal Science. The publication describes the use of antibody landscapes to develop immune system profiles of individuals previously exposed to influenza and how this analysis could be applied to improve influenza vaccine selection processes and hence increase influenza vaccine effectiveness. aA/South Australia/55/2014, A/Norway/466/2014 and A/Stockholm/6/2014 are A/Switzerland/9715293/2013-like viruses. This recommendation has changed from the vaccine composition for the northern hemisphere 2014-2015, reflecting antigenic drift in circulating A(H3N2) and B/Yamagata lineage viruses. 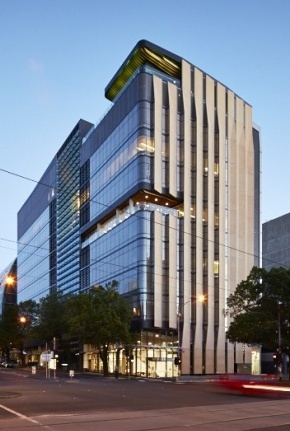 The Centre and the rest of VIDRL recently moved premises to the Peter Doherty Institute for Infection and Immunity, a partnership between the Royal Melbourne Hospital and The University of Melbourne. The Centre has been awarded an A*STAR/NHMRC joint grant for research projects utilising integrative technologies to combat emerging infectious disease in partnership with the Bioinformatics Institute in Singapore. The project, titled "Determining the clinical effectiveness of antiviral drugs against oseltamivir- and laninamivir-resistant influenza viruses in animal models", will be led by Dr Aeron Hurt from the Centre and Dr Sebastian Maurer-Stroh in Singapore and has been awarded more than AUD$690,000 total funding (shared between the Centre and Bioinformatics Institute) over 3 years, beginning 1 January 2013. It is recommended that quadrivalent vaccines containing two influenza B viruses contain the above three viruses and a B/Brisbane/60/2008-like virusc. c B/Brisbane/33/2008 is a B/Brisbane/60/2008-like virus. * It is recommended that A/Texas/50/2012 is used as the A(H3N2) vaccine component because of antigenic changes in earlier A/Victoria/361/2011-like vaccine viruses (such as IVR-165) resulting from adaptation to propagation in eggs. This recommendation has changed from the vaccine composition for the southern hemisphere 2013, reflecting antigenic drift in circulating B/Yamagata lineage viruses. Dr Aeron Hurt, research scientist and Head of the Antiviral Drug Sensitivity unit at the Centre, was awarded runner-up for the Scopus Young Researcher of the Year Awards 2012, Life Sciences and Biological Sciences category. The awards, which are presented by Elsevier and the Australasian Research Management Society (ARMS), recognise outstanding young researchers in Australasia who have made significant contributions in their areas of research. Dr Hurt has been recognised for his work in neuraminidase inhibitor resistance in influenza viruses. It is recommended that quadrivalent vaccines containing two influenza B viruses contain the above three viruses and a B/Brisbane/60/2008-like virus****. **** B/Brisbane/33/2008 is a B/Brisbane/60/2008-like virus. This is the same recommendation as the vaccine composition for the northern hemisphere 2012-2013, indicating that the circulating viruses have not undergone significant antigenic drift since the last Consultation in February 2012. This is the first change to the vaccine recommendations since 2009, reflecting antigenic drift in circulating A(H3N2) viruses and an increased proportion of circulating influenza B viruses of the B/Yamagata/16/88 lineage relative to the B/Victoria/2/87 lineage. Image (courtesy of Ivan Babovic, WHO): WHO officials, advisers from the WHO Collaborating Centres for Influenza and Essential Regulatory Laboratories, and observers from other centres in WHO GISRS attending the Consultation. This is the same recommendation as the vaccine composition for the northern hemisphere 2011-2012, indicating that the circulating viruses have not undergone significant antigenic drift since the last Consultation in February 2011. The past month has seen high levels of influenza activity in the northern hemisphere as the winter continues. In contrast, transmission levels remain low in the southern hemisphere. Updates on global influenza activity are available on the WHO Global Alert and Response webpage. See our surveillance data map to view the distribution of influenza viruses in different countries during 2010. The fifth WHO Collaborating Centre for Reference and Research on Influenza was recently launched at the Chinese National Influenza Center in Beijing, China. The Centre in Beijing adds considerable capacity to WHO GISRS to monitor circulating influenza viruses, particularly in Asia and China itself. 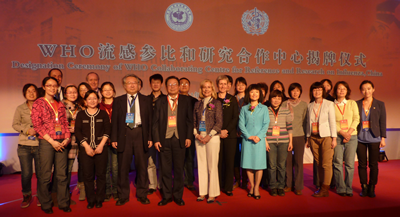 Image: The designation ceremony for the new WHO Collaborating Centre for Reference and Research on Influenza in Beijing was attended by Directors of the WHO Collaborating Centres in Atlanta, London, Melbourne and Tokyo; Prof Yuanji Guo (Former Director of the Chinese National Influenza Center) (front centre); Dr Wenqing Zhang (Global Influenza Programme, WHO Headquarters) (front, in blue); and staff of the new Centre. This is the same recommendation as the vaccine composition for the southern hemisphere 2011, indicating that the circulating viruses have not undergone significant antigenic drift since the last Consultation in September 2010. The Influenza season has practically ended in Australia for 2010 with only sporadic cases being reported. The season which started later than usual peaked in September-October and then rapidly decreased. In New Zealand ILI activity has also returned to background levels after a moderate season which also started later than usually seen. By far the most commonly detected viruses in Australia have been pandemic H1N1 2009 viruses with around 81% of viruses being of this type and a small proportion (about 9%) being A(H3N2) viruses and B viruses (around 10%) (see here for viruses tested at WHO CC in 2010). In New Zealand nearly all viruses detected were H1N1 pandemic viruses with a small number of A(H3) and B viruses. No seasonal H1 viruses that circulated widely until the pandemic arose have been detected in Australia or New Zealand in 2010. More information on the Australian and New Zealand influenza seasons is provided by the Australian Department of Health and Ageing and ESR, respectively . Low levels of influenza are circulating elsewhere in the region (see WHO FluNet).